"Sampath Speaking" - the thoughts of an Insurer from Thiruvallikkeni: Poopoova paranthupogum 'butterfly' effect and impact of rock salt on them..
Poopoova paranthupogum 'butterfly' effect and impact of rock salt on them..
‘Dhikku theiryatha kattil unnai thedi alainthen’ is one of the many songs of the great Tamil Poet Subrahmanya Bharathiyar. ‘Thikku Theriyatha kattil’ (in a forest lost in directions) was also the name of a hit movie released in 1972 starring Muthuraman and Lakshmi … a song ‘poopoova paranthu pogum pattu poochi akka’ – a child asking the butterfuly as to who gave it such a beautiful shirt ! The monarch butterfly (Danaus plexippus) is a milkweed butterfly (subfamily Danainae) in the family Nymphalidae. Milkweed butterflies lay their eggs on various milkweeds on which their larvae (caterpillars) feed. It is one of the most familiar North American butterflies. Its wings feature an easily recognizable orange and black pattern; males are also slightly larger than female monarchs. The eastern North American monarch population is notable for its southward late summer/autumn migration from the United States and southern Canada to Mexico, covering thousands of miles. The name 'monarch' may be in honor of King William III of England. The monarch was originally named by Linnaeus in his Systema Naturae of 1758 and it was placed in the genus Papilio but later was rive the new genus- Danaus. In posting about ‘Amma Uppu’ (the salt effect of CM in Tamil Nadu) – I had briefly touched about the chaos theory, the butterfly effect - the sensitive dependency on initial conditions in which a small change at one place in a deterministic nonlinear system can result in large differences in a later state – as also on the interesting link of salt to butterfly ????... A peep into the animal world is always interesting and National Geographic provides deep insights into the happenings over there – which most of us may not even dream to know… here is something collated from a couple of interesting articles in National Geographic. Road salt used to clear snow-covered roads in the United States is creating beefier monarch butterflies, a new study says. When snow melts, road salt runs into nearby soil and into the roots of common plants, which are in turn ingested by caterpillars. Then, as they become adult butterflies, their brains and muscles develop abnormally: The females develop larger eyes and brains, and males develop more muscle. These are potentially positive changes, as they aid the butterflies in elements of mating and reproduction. Larger muscles help males fly longer and farther, enabling them to find more mates. Larger eyes allow the females to seek out better plants on which to lay their eggs. Just like in people, sodium is good for butterflies in low quantities: It’s one of most important elements of muscle and brain development. But there’s a catch: “As [the salt] increases a little bit, that’s probably a good thing for them,” said study co-author Emilie Snell-Rood, a biologist at the University of Minnesota. “As it increases even more, it becomes toxic and stressful.” ~ and there’s evidence that road salt is on the rise: Following the harsh winters of 2011 and 2013, the sodium content of roadside plants increased by as much as 30 times compared with previous years, according to another study. Snell-Rood’s research came about in 2011, when she moved to the Twin Cities metropolitan area and noticed how much road salt is applied to the roads—more than 350,000 tons annually. She suspected that this overabundance of sodium could be affecting animals that feed on roadside plants. Her team decided to study monarch butterflies because the species feeds on milkweed, a common roadside plant in Minnesota. 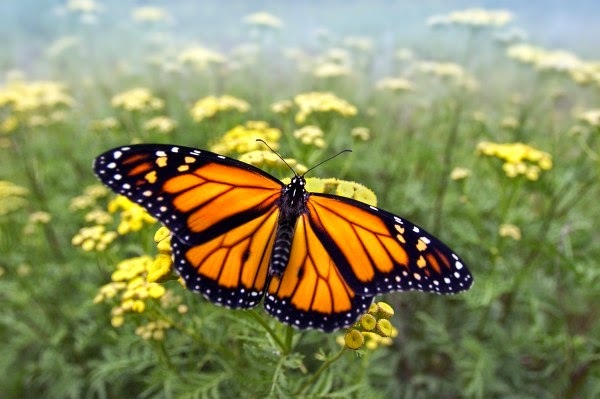 From 2011 to 2013, they raised monarch butterflies on two types of diets: sodium-rich roadside plants and low-sodium prairie plants. After six weeks the team recorded both groups’ survival rates. The results showed that although the caterpillars grew bigger, it wasn’t ultimately beneficial: The caterpillars that ate roadside plants had a 40 percent survival rate, compared with a 58 percent survival rate for those fed prairie plants. The added sodium has “huge implications” for monarch butterflies’ development, said study co-author Anne Espeset. It “can change whether or not they have the ability to migrate,” since the females would not have the muscle capacity to handle migration. That could be particularly worrisome for some monarchs, whose annual migration south to Mexico each winter has sharply declined in recent decades. The 2014 winter has been unusually severe across much of the United States, requiring transportation agencies to put down large amounts of salt to melt snow and ice on roadways. National Geographic in another article states that last year, U.S. officials applied about 17 million tons of salt to roads. Ron Wright, who manages snow and ice removal for the state of Idaho and co-founded the industry group Pacific Northwest Snowfighters, says this winter has left transportation departments scrambling for salt, especially in the East and Midwest. The salt used on roads is often called rock salt, because its grains are much coarser than table salt. Most rock salt for roads is mined "dry" from underground seams of crystal salt, which formed from the evaporation of ancient seas. It is stated that rock salt "comes from all over the world." The rock salt under Detroit was first discovered in 1895. In early days, when the salt mine produced 8,000 tons of rock salt each month, much of it hauled by donkeys, lowered into, but reportedly never brought back up, from the mine. Because of its local resource, Detroit was the first city in the world to apply salt to its roads in 1940. Detroit's salt mines closed for a time in 1983, due to falling prices for salt, but they were reopened in 1998. and when more salt is required - because of increased demand, rising prices may become a concern. Another study carried out by Marquette University in Milwaukee, Wisconsin, found that road salt reduced crashes by 88 percent, injuries by 85 percent, and accident costs by 85 percent. So certainly more than butterfly effect – salt affects butterflies and other lives too.